I understand this time of year can be a little hectic for parents of seniors; focusing on their child's future, scheduling college interviews, and tying off the loose ends like prom, yearbook orders, and getting those senior photos taken. For me, shooting senior photos is a blast, especially when a client wants to go "on location" and explore the settings downtown Denver has to offer. As a photographer, there's really nothing I enjoy more than incorporating vibrant and unique backgrounds into a shot. When Omar's parents contacted me to book a shoot for their son's senior photos, they let me talk one-on-one with Omar so we could discuss the project. He immediately liked the concepts I had in mind; and was excited about using Denver's eclectic Five Points neighborhood as a backdrop for his portraits. Since playing and writing songs on his guitar is his favorite pastime, I had Omar bring his acoustic guitar along on the shoot. On the day of the shoot, the weather worked out perfectly -- we had clear skies and great sun. We actually had a little too much intensity from the overhead sun, so I implemented off-camera flashes from two different angles to provide some fill and rim light. This helped me control the environment a little more, to get the lighting style I wanted for this shoot. 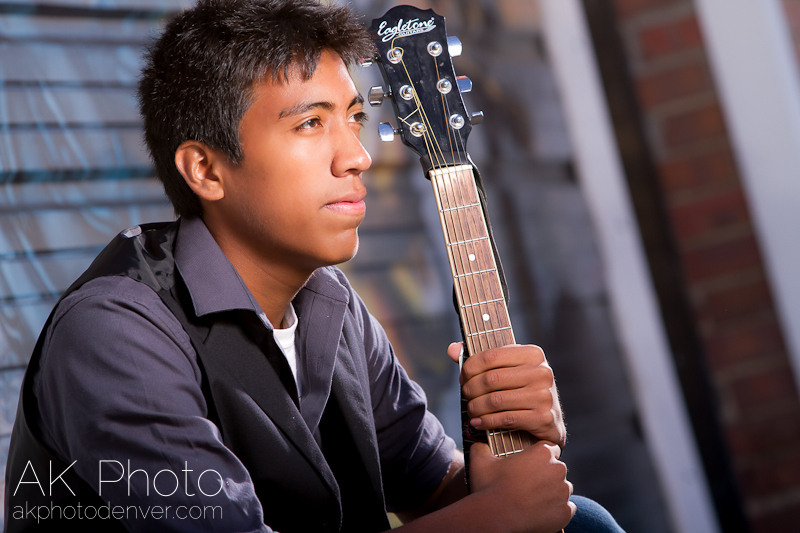 Need senior photos? Contact me today! Overall I think we got some great shots, and below is just a small sample of the large portfolio I had assembled for Omar and his family on CD. While the last photo was not a favorite of his parents' (because Omar was squinting) - visually, it ended up being one I personally liked, and I just had to include it in this post. 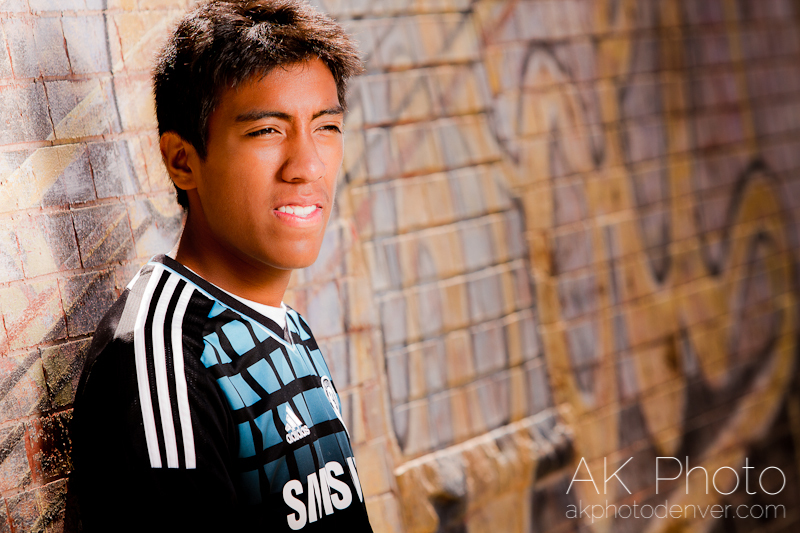 Granted, it may no be yearbook material, but I felt the way the sunlight and fill-flash illuminated Omar, in contrast with the mural art in the background, just worked.